Sphinx Hijinx Classic Slot Guide & Review - Casino Answers! Sphinx Hijinx is a 3-reel, 1-line multi-coin slot machine with a wild symbol developed by the Cryptologic casino software provider. You can play Sphinx Hijinx at InterCasino and VIP Casino. To play the Sphinx Hijinx slot machine, first set your coin value. Options for coin values are $0.01, $0.05, $0.10, $0.25, $1, $2 and $5. Hit “Bet One” for as many coins as you wish to play followed by the “Spin” button. If you want to play the maximum 3-coin bet and spin the reels, hit the “Bet Max” button. The Sphinx symbol is the top fixed jackpot on Sphinx Hijinx, worth up to 3000 coins. It also acts as a wild symbol, which means the Sphinx symbol can substitute for other symbols to complete winning combinations. Payouts on the Sphinx Hijinx slot machine are (1/2/3 coin payouts in parenthesis): 3 of any bar symbols (2/4/6), 3 single bar symbols (5/10/15), 3 double bar symbols (10/20/30), 3 triple bar symbols or 3 pyramid symbols (40/80/120), 3 pharaoh symbols (80/160/240) and 3 sphinx symbols (1000/2000/3000). The Sphinx Hijinx slot machine has an autoplay feature found at the right of the reels. Hold the up arrow and you can play up to 99 autoplay spins. You can stop the autoplay feature at any time. 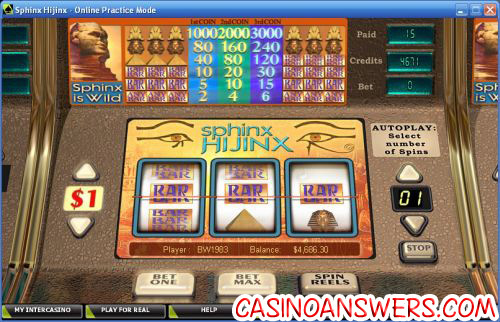 Sphinx Hijinx is one of the most basic slot machines that you can find at Cryptologic casinos. It’s not the type of slot machine that we’d recommend you go out of your way to play, but if you’re playing at InterCasino or VIP Casino, it wouldn’t hurt to try it out for a few spins. It makes for a decent enough penny slot machine. If you are looking for a great casino to play the Sphinx Hijinx slot machine at, we recommend you take advantage of the $225 signup bonus at InterCasino. Where can American players find a casino that has Sphinx Hijinx? Sphinx Hijinx is not available for US-based players. For a similarly themed slot machine that US players can play, please read our Pharaoh’s Gold Slot Machine Review. Where can I find some other Egyptian-themed slots? In addition to Pharaoh’s Gold at Realtime Gaming casinos, there are seemingly numerous Egyptian-themed slot machines and video slots at almost every online casino. Crypto-powered casinos like InterCasino has Cleo Queen of Egypt. Microgaming casinos including First Web Casino has Pharaoh’s Fortune and Pharaoh’s Tomb. You can find a slot called Pyramid’s Treasure at Reef Club Casino. Cameo Casino as well as other Playtech casinos have Queen of the Pyramids. Finally, the US-friendly Vegas Technology casinos including Caribbean Gold Casino have Cleopatra’s Pyramid, King Tut’s Treasure and the Last King of Egypt. We expect that this is only the start and there are many more Egyptian-themed slot machines to come. For a complete list of Egyptian online slots, please read our list of Egyptian slots. What Egyptian slot machines are there?